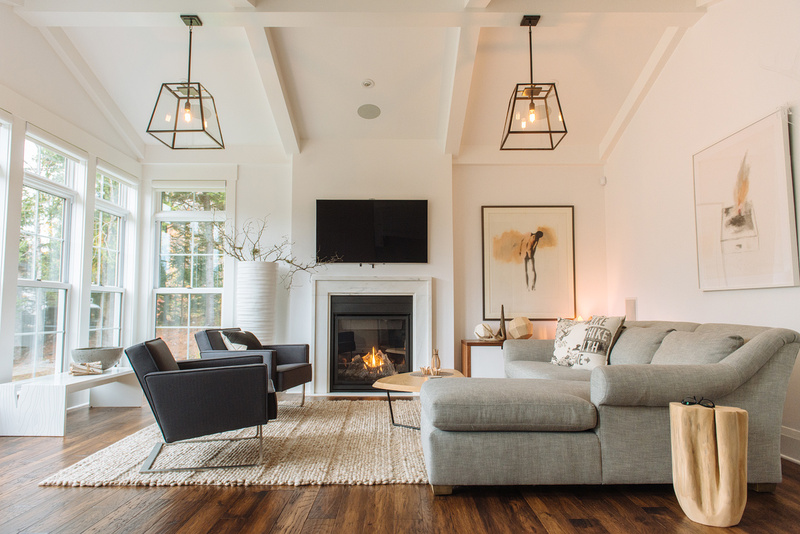 This was featured on HGTV.ca – you can see the original post here. Photo: Sean McGrath – Bouquet of Flowers by Creative Designs by Beth, sit inside a ‘Love is Blind’ vase (braille) by Jessica Lertvalai at TUCK STUDIO. The patina champagne bucket belonged to my husband’s late parents, given to them by their children on their 25th wedding anniversary. Vegan Cupcakes by Bite by Michelle with handmade heart decorations (used from leftover scraps of wall creation); cutting board with etched antlers by Swaine Street Woodworking (Tuck Studio); vegan chocolates in foil by Denman Island Chocolate, available at The Feel Good Store. Pink Pig – ‘Bank in a form of a Pig’ by Harry Allen, available at TUCK STUDIO. With a Valentine’s Day dinner for eight in the works, I thought it would be the perfect opportunity to switch out our backsplash. I asked my co-worker at punch inside, Sarah Tapley, to collaborate with me on a unique and original DIY backdrop to replace the wallpaper design that had been behind the plexiglass since we installed it last fall. Luckily, I’m not a big fan of stereotypical Valentine’s paraphernalia either, so we opted to go with a Black/White/Metallic Valentine’s theme, with just a dash of ‘color’ for effect. Scotch Banner & Sign Paper: 1 Roll 30” x 15’, $4.99 at Michaels. Various patterned and coloured sheets of paper, .79 cents – $3.49 a sheet at Michaels. Marimekko gift wrap from Crate & Barrel. Spray Paint KRYLON Sateen, Nickel. Under $6.00 at Kent’s. Take note of the placement of plugs. Roll out your craft paper and pencil in your measurements using a measuring tape. Use a utility knife to cut your paper to fit and cut out any holes you may need for plugs. Cut out a stencil of whatever shape you wish for your background pattern. Use any paper (the thicker the better). Here, I drew then cut out a heart shape, and then cut smaller hearts out of the interior. Roll out your paper (outside if possible or in a well-ventilated area). Lay your stencil down, starting at one corner of your paper. Spray lightly and move quickly across your stencil (you don’t end up with pools of paint). Wait a few seconds and then move your stencil whichever way you like to create your pattern. Source a heart shape you like on line, print it and use it as your stencil. Lay your heart stencil down and trace (on the back of your chosen patterned paper), fitting as many on the sheet as you can. Once you are done tracing, cut out all of your hearts. When your backdrop sheet of paper is dry, bring it in and roll it out again. Lay out your hearts on your paper. Move them around to get a good sense of where you want them to go. Once you have them in the pattern and order you wish, glue them in place. Map out and measure where you want your text. Peel and stick your decal. Photo: Sean McGrath- here our kitchen is transformed by the new addition of a Valentine backsplash. 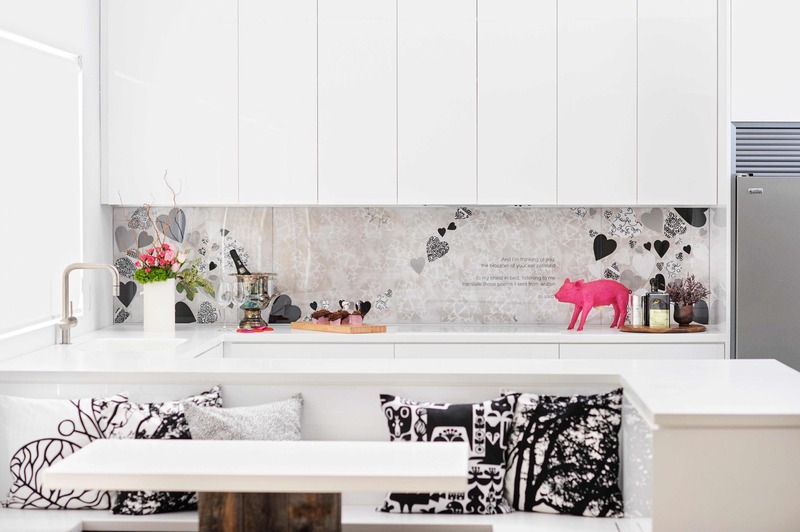 Keeping with the serene design of black and white, the hearts appear to float over the counter.